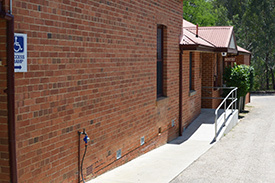 Michelson’s Dental Surgery is accessible for both wheelchairs and walkers. Founded over three decades ago by Dr Anne Michelson, Michelson’s Dental Surgery brings gentle, trustworthy oral care to Wangaratta residents and their families. Although many other dentists are now part of our team, each one shares Dr Michelson’s mission of providing a positive experience to even the most nervous dental patients. Located on the ground floor, our clinic is both wheelchair and walker accessible. The open environment of our heritage building improves accessibility for your family’s dental care. Combining up-to-date equipment with a relaxed but professional team, we’ll help put your mind at ease. There is also a separate children’s play area to keep little ones entertained during your visit with us. 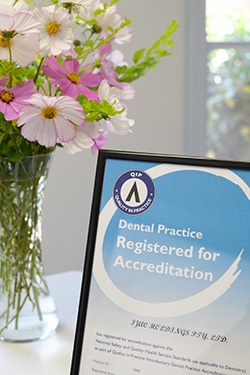 As a QIP Accredited Dental Practice, Michelson’s Dental Surgery ensures the highest level of quality care to both our patients as well as our staff. We have adopted the National Safety and Quality Health Service Standards and implemented them in a manner to provide exceptional oral healthcare in a safe environment. For your reference please view the Australian Charter of Healthcare Rights. It isn’t uncommon for residents in the Wangaratta area to put their oral care off due to a fear of going to the dentist. Our team strives to create trusting relationships with each patient. Our gentle methods and anaesthetics option allow us to complete dental treatment in the most comfortable environment possible. Our practice is small enough to provide a warm atmosphere but big enough to provide a variety of dental services and conveniently serve our neighbours in the surrounding towns. If you’re searching for a new dentist, we invite you to contact Michelson’s Dental Surgery today on (03) 5721 8033.